Mobile camera or webcam footage you can see live on the web, just like on TV is broadcasting a live match .. So, either you or the program will be recording a live chat software will make its live streaming coverage. With conventional methods, it is also extremely easy. But the trouble is that the previous practice of recording you will have. The recording in the phone memory or SD card will be empty. If the program is long stretch then memory may be full. In others ways, there can be a live streaming problem and video clarity problem. Enjoyment of the live concert's will another thing and it not be so charm also. We are going to tell you a way by which neither your smart phones memory will be get full and you will also get good video clarity. This all feature is available on website http://www.ustream.tv . 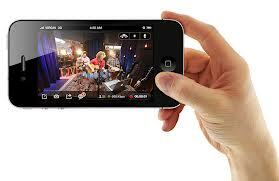 You can also broadcast live all concert, wedding, or award function. While this too, there is an option that user can open a channel like YouTube and also publish any live footage of your choice can also publishing. For this you must have Android or iPhone or you can live broadcast from your PC web cam also. After that go to http://www.ustream.tv and signup for free. After that download app on your smart phone and login with your username and password. now your friends or relatives can view live footage from your channel. you can also publish the video on your channel by using publish option and after that share it on Facebook or twitter accounts or others social networks.